Why Pursue Medical PG Abroad? Indian doctors who have completed MBBS in India or anywhere ABROAD have to write All India Medical PG Entrance Exam which now comes under the ambit of NEET. Needless to say that the percentage of students who can successfully clear this test is abysmally low as most of the meritorious students from Government Medical colleges bag maximum number of seats. Government medical colleges for postgraduate in medicine has roughly 15000 seats out of which half are in reserved category. The number of MBBS pass outs is around 50,000 in 2016 from India while number of students appearing for Medical PG entrance exam in India has risen from 64,000 in 2011 to 100,000 in 2015. This means less than 7% of the Medical PG aspirants get their PG medical seats in government colleges. This percentage is then divided in around 48 specializations for post graduate courses in India. Most of the students do not get their chosen specialization and compromise by taking the options available to them from this pool. The average number of times majority of the students take Medical PG entrance exam in India is 2-3. After which many drop their dreams of pursuing medical PG. At S V Videsh Vidya we present a Unique opportunity for Indian Students who are flexible and have hard working attitude to get the field of their choice by taking up Medical PG Abroad or Clinical PG abroad. Indian Students with MBBS in India or MBBS in Philippines or MBBS in Georgia can not practice directly in USA because it is must to have degree in Medicine PG in USA. To apply for medicine PG in USA, student has to clear USMLE at various levels. USMLE has clearly defined levels of medical courses after MBBS that is mandatory to be completed in USA. Student has to then, qualify for Residency (Board certified PG while working in a Hospital under work permit). After MBBS, the above exams needs to be cleared. Indian doctors have to pass the above exams with high marks (230+). During this period, the students can give USMLE-2 CK exam in India to qualify for the Residency in USA. The doctors can then apply for work visa in USA once they get the residency confirmation. MBBS qualified doctors from India prefer to take admission to Master in Public Health as it can get 5 years student VISA by this time students can work hard to clear USMLE 3. This will help them in preparing for USMLE 2CS and its best option as they get 2 degrees, one clinical and one non-clinical one such as ”Masters of Public Health” in USA before they start their Residency to complete postgraduate medical courses in USA.During MPH course students can get chance to build network with medical practitioners and hospitals. 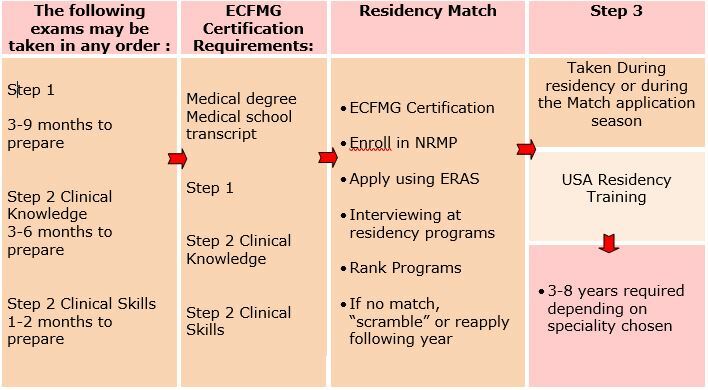 They can take break between semesters and complete clearkship which is mandatory step for getting residency.The cost to complete Medical PG in USA with this entire route is around US$ 50,000 (with 3 months of Clinical Rotation / Clerkship) if you can crack USMLE-2CK / CS after only 3 months of Clinical rotation. The Cost is again Rs. 10 Lacs (approx.) as students can earn while pursuing education. UK is a favourite destination for doctors from India who are interested in pursuing MS / MD.There are 3 ways to pursing PG medical education in UK. However, for all options IELTS with Band 7.5 is mandatory. Third option is direct admission without PLAB but students cannot get any Clinical experience. During this courses students have to apply for GMC Registration and appear for PLAB and MRCP for further clinical experience in UK. Most of the Medical universities in Germany teach MBBS and Medical PG absolutely free of cost. Although, there is a small catch. Students need to learn German Language upto C1. In Germany, the Medical council of Germany undertakes the process to grant admission to International students and has clear guidelines and procedure for medical education in Germany. If you study/have studied MBBS in a medical university in Germany(in German language) then pursuing MD in Germany is going to be an easy road. Although, if you apply directly after MBBS in India, you may meet challenges in terms of language learning. We suggest that to make this process smooth you can learn German language at S V Videsh Vidya, offered in both Offline as well as Online mode. This will clear the path towards medical practice in germany through series of steps that include Observership, Approbation, Licensing, Residency and MD approval. To know more about steps to take for medical PG in Germany and other necessary Visa information, Contact us at S V Videsh Vidya. Stipend upto 2300 Euros paid for to students pursuing residency / Clinical PG in Germany. Students should register as German Medical Practitioner with German Medical Licensing Authorities called as Approbation System. B2 and C1 Lang level program or 1 year of Masters (MHM or MIB) student will be eligible for 18months work search visa. For the living expenses students should open a Blocked account in German Bank for amount of 8640 Euros.The entire process costs 13 to 15 lakhs. Mandatory to clear C1 level in order to pursue PG medicine in Germany. For Residency it is mandatory to have recommendation letter from the doctor while doing the observership and the personal interview at the hospital, the doctor could pursue his residency (Minimum 3 years – but depends on the specialization) in a German hospital. On successful completion he is eligible for the Board certified MD degree by German medical council. 1 year Masters program (Non-Clinical) in Germany would be EUR 20,000 per year. Average ranking private universities would costs starting from EUR 13,000 per year. Mandatory to pass the Kenntnisprüfung exam .